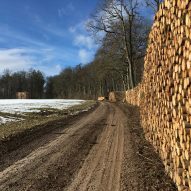 John Pawson has stacked up 61 tree trunks to create a space of rest and contemplation on a cycle route in southwest Germany. 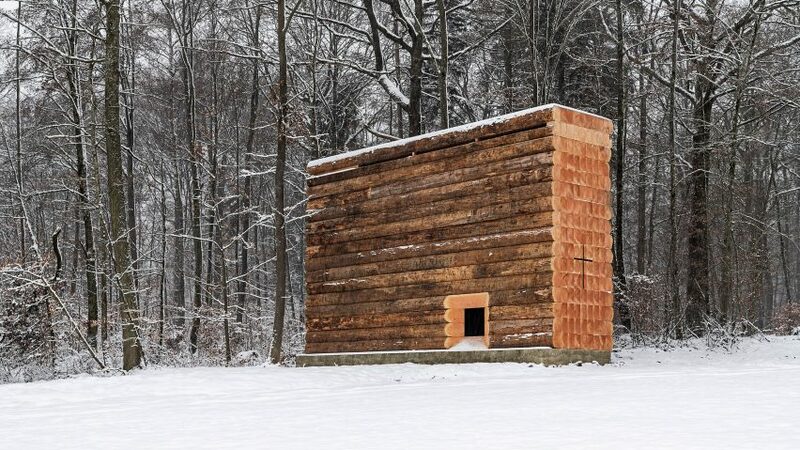 Wooden Chapel is one of seven new rest stops commissioned by the Siegfried and Elfriede Denzel Foundation along a cycling path through the Bavarian Forest. "The client wanted to provide sanctuary or contemplation space," said Pawson, unveiling the project at the Design Indaba conference in Cape Town last week. "He commissioned seven architects: six from Germany, and me." With a brief to primarily use wood for construction, Pawson's design is based around the idea of keeping the material close to its natural state. 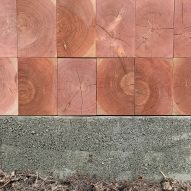 Trunks of Douglas fir were cut down into chunky rectilinear beams and stacked up, so as to look like "a pile of logs stacked up to dry". "It's just trunks of Douglas fir stacked on top of each other," Pawson explained. "There's a minimum of cuts, so everything is solid." Contemplation spaces are a regular feature in the work of the London-based architectural designer – a title he has to use, as he never completed his architectural studies. Among his best-known projects are the Nový Dvůr monastery in the Czech Republic and the St Moritz Church, also in Bavaria. The Wooden Chapel is considerably simpler than these two projects, containing just a single room where passing cyclists can find rest and shelter. But it is still designed to create opportunities for spiritual reflection. Its entrance is a rectangular opening carved out of one side of the structure. 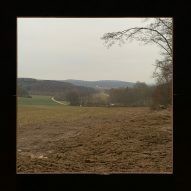 Once inside, a window opening on the opposite side offers a framed aperture of the surrounding rural landscape, as well as the church spire in the nearby village of Unterliezheim. 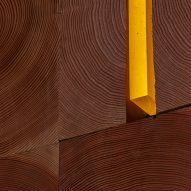 Another thing that is only revealed once you enter is the scale of the space – from outside, it is nearly impossible to tell how much of the wood has been cut away from the centre of the stack. The floor is formed of a concrete plinth, which helps to keep the structure weatherproof, while also elevating it in the manner of a sculpture. Light is drawn into the interior from slender, high-level openings that run along the two longs sides of the structure like clerestory windows. There is also a simple cross carved out of one of the end walls and infilled with coloured glass. "Openings cut into the envelope express the thickness of the wood, while the narrow entry deliberately recreates the sense of physical proximity encountered as one moves through the dense woods," said Pawson's studio. "Inside the chapel, the glory of the cut timber is immediate, in its warm hues, tactile surfaces and the patterns of the sawn grain." The wood for the project was supplied by Danish company Dinesen, which Pawson has been collaborating with for over 20 years, since working together on his minimalist home and studio in west London. Pawson presented Wooden Chapel, among other projects, in a 20-minute presentation at Design Indaba 2019, which took place from 28 February to 1 March. Dezeen was media partner for the event.